I wanted to do a quick post to show you my latest Fall addition. ﻿The Osage Oranges (aka Hedge Apples) were collected off the ground at a local restaurant…with permission of course. I just love the color and texture of these. The hydrangeas were free and picked from a bush owned by a sweet antique/junk dealer. At his home he has a small shed and another larger building full of things for sell. You just pull in his driveway and he comes outside and unlocks the buildings for you. I asked if I could pick a couple of the Hydrangeas and he ended up giving me about a dozen to dry. a fabulous home for us to tour this week. Hi Sherry, Love your arrangements. Beautiful colors and beautifully photographed. I'm waiting for a "certain" tree to drop its lovely green oranges. Very nice arrangement! 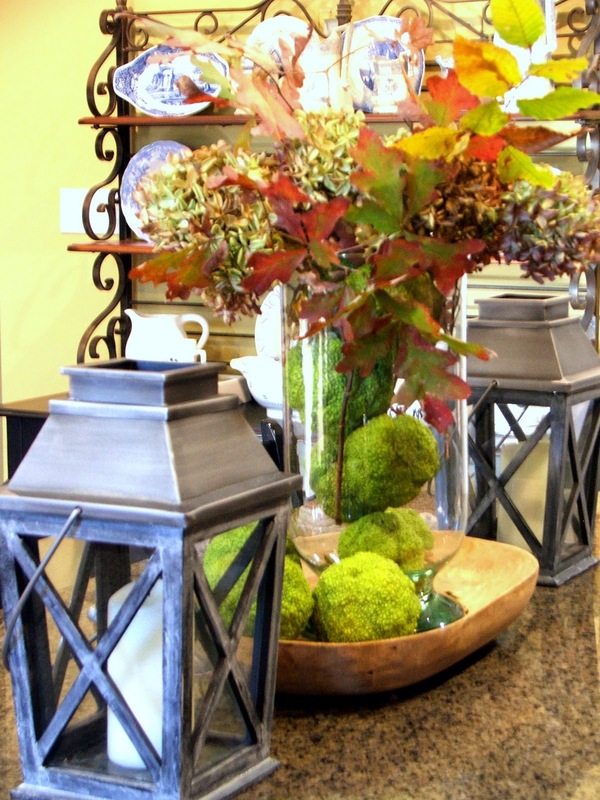 Can't go wrong with dry hydrangeas…your lanterns are great as well! Very pretty Sherry!~come by and enter my Transferware giveaway please! A beautiful arrangement. Love the mix of all the different textures, great price, too. I love those osage oranges or whatever they are called. How nice to be given the hydrangea blooms, too. Beautiful arrangement. The arrangement is gorgeous, Sherry! The combination of natural elements is beautiful, as is your photography. My friend, your newest autumn vignette is simply delicious! No one can do autumn better than nature herself! I love the bright green of the hedge apples. Would love to get my hands on a few. You know, I have never seen them…other than in photos. I wonder how long they last? Anyway, your autumn vignette really is gorgeous and your photos are spectacular, dear friend! Thank you for sharing with us! Sherry…soo beautiful! Love your style, you have the perfect touch, next to the lanterns, its perfect!! I definitely want to look around and see if they have any of those little green balls here, Sherry! They really make a nice little arrangement additive and the color works all year round. Beautiful arrangement! You can't beat decorating with nature. I have to go out on the side of a four lane highway to collect osage oranges Sherry, sure wish I could just drive up to a restaurant. Your arrangement is beautiful and the price sure is right. Thanks for sharing. That is such a gorgeous arrangement for Fall! I love using things from the yard to decorate with. I think it's more special that way. Love those osage oranges too. Sherry, I, too, like to use hedge apples for fall decor, but there are non to be found here this year. I suppose the drought and severe heat may be the reason. Like the way you filled the glass container. Clever idea. Beautiful Arrangement! Love the natural elements in such lovely colors! Beautiful arrangement and I love those lanterns! Sherry, I'm so happy to know that I'm not the only one who picks up hedge apples off of someone else's property! In Kansas I'd help my neighbor out by taking a boatload, and here in IL my dear husband has stopped and picked up tons of them by the side of the road. I LOVE decorating wth them! Your display is beautiful. Love your free fall arrangement! There is something about that bright green and wood…my favorite combination…..Love! What a beautiful arrangement! Love all the colors and the green oranges/apples…love them! I've never seen them before, but love the color and texture…they add so much to your arrangement! This is fabulous. I love decorating w/ natural elements. Sweet! Put it on a cover someone. Sherry, I just love the hedge apples! What a beautiful arrangement and for free! What a doll he was to give you ht hydrangeas! I collected my last roses before the final frost, couldn't let them go to waste! I love having real arrangements in the house. It looks so great with the lanterns too. 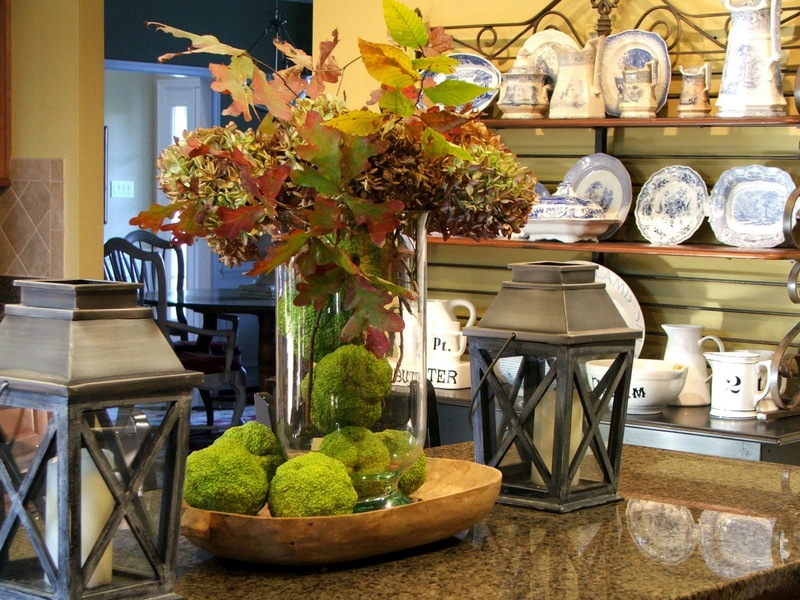 I love decorating with natural things…..I did not know they were hedge apples….love thy hydrangeas also….. I sure wish we had Hedge Apples here…they are gorgeous! and your beautiful arrangement is a wonderful expression of the very essence of Fall. Just stunning, Sherry! The vibrant green and nubby texture of the hedge apples makes a wonderful late fall decor! Mother nature is a generous donor to your lovely fall vignette! Nature and natural is the only way. Richard from My Old Historic House. So pretty and I love that it's all natural. I've never heard of hedge apples, are the the round, moss covered spheres? I don't think we have them in California. Love the hydrangea and branches of fall leaves. Absolutely gorgeous! I love those funky green oranges. Another lovely home! Thanx for hosting Sherry!